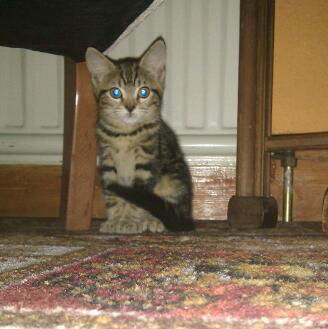 Please meet Holly the latest kitty to join the family. However I hasten to add she is Matt's parents new pet and not ours but we as a proud aunty and uncle will be keeping an eye on her. She is only 9 weeks old and was one of five other kittens who came into our local wood green Animal shelter. It was a tough decision as to which one to choose because as usual the animal shelter was over run with lots of unwanted kittens at this time of year and so we were shown at least 12 different kittens of various ages, colours and temperentnts to choose from. But Holly won the heart of Matt's mum by sitting still and snuggly in her hands whereas all the others were running around like mad things. Of course it was a ruse and as soon as Holly got home she turned into speedy Gonzales. I have told Shelley and Byron that they have a new little cousin, they seemed unconcerned but i'm sure if they meet her they will love her too.